The Magpie's Nest...: The Magpie a member of the Masons? No, not really, but he will pass on the everyday secret of how to detect a closet NLP supporter – even without a secret handshake. The Magpie a member of the Masons? No, not really, but he will pass on the everyday secret of how to detect a closet NLP supporter – even without a secret handshake. out on the parade ground of politics, before the electoral march by is finished. 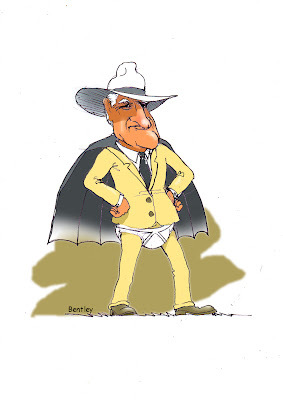 And a lot of other drivel, including Bob ‘Cut Snake’ Katter inviting the media to a shoot-out at the OK (Only Katter) Corral, moneybags Clive Palmer clowning around, and the Dale Last team member who has a hitherto unrevealed and closely guarded family fact about the Fountain of Youth. Premier Anna Blight may fall short in some people’s estimation …. oh, about 99.9% of people …. but one thing she ain’t is a dill when it comes to election campaigns. Although her ploy to delay the Queensland election in the hope of getting some reflected gloss from the flood and dam inquiries seems to have backfired big time - whoever wins could be facing a billion dollar liability payout - she was clever enough to ensure a gruelingly long campaign. Her carefully spun plan was to make it long enough for Campbell ‘Gunna’ Newman to put his parade-ground glossed shoe in his somewhat frog-like gob. And there are early signs that he is already playing fly to Ms Blight’s spider. Which brings us to the secret of how to detect an undeclared LNP supporter. Easy. They are the one’s with red foreheads which result from repeatedly looking to the heavens and smacking their foreheads in frustration at Gunna’s latest ill-considered pronouncement. It started with the Joh-like declaration that the people of Ashgrove would be on the gravy train, because of the ‘advantages’ of having a premier as their local member. He just stopped short of adding ‘Just don’t you worry about that.’ SMACK. Then there was the fanciful and somewhat goofy suggestion of creating around half a million jobs in his first term on the government plush. SMACK. Then, even when backing away from the idiocy of that claim, our boy cast doubt on his mental stability when he tried to explain away the dodgy jobs maths in a radio interview by suggesting ‘it must have been the other Campbell Newman’ who said it. SMACK. 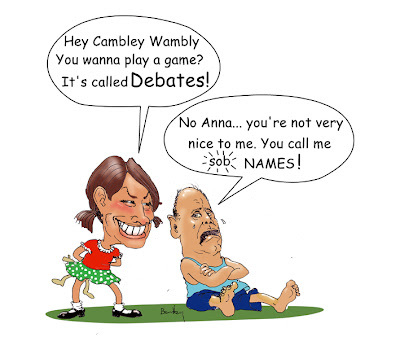 And lately, Gunna Newman came over all sooky and blubby when declining to debate Premier Blight unless she promised not to say nasty things about him and his family finances. SMACK and double SMACK. Because that was definitely a bit rich coming from the bloke who started the low-down stuff when he declared last October that the state was being run by ‘drunks, punks and desperadoes’. Bentley thinks the whole debate stuff a childish waste of time. So it isn’t all that surprising that Gunna Newman is losing support in Ashgrove – he was still miles ahead of incumbent Kate Jones in the latest poll released during the week, but he had lost several percentage points to drop below 50% approval for the first time. It’s a long way to go in this campaign, and one side will be smiling and listening, the other will be hoping they haven’t smacked themselves silly by polling day. The Magpie, ever helpful and caring old bird that he is, has come up with a great idea for the LNP. For those nervous nellies in the party, who are all knocked kneed and clutching at their nighties with anxiety, here’s an idea. 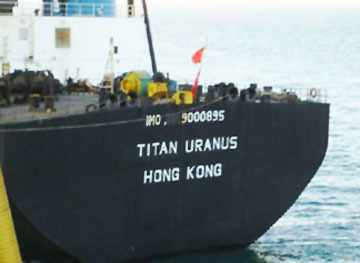 Up in Hong Kong, there is a freighter which the LNP should buy as its campaign flagship, and encourage doubting members to 'man up'. Now, about here in this column, The ‘Pie should apologise to one Robert Carl Katter, founder of the Cut Snake Party – remember his slogan ‘ I’m as mad as hell, and you can take that anyway you like’. But just in case some ‘lady men’ migrant up here from southern climes, Bob seem to want ensure those in the right-thinking populace to be able to protect themselves from this menace. To this end, if he gains a position of power in Queensland, he will loosen up gun laws. This would include scrapping any requirements whatsoever for air rifles - just pop on down to Toys’R’Us and buy one for the young nipper. Just hope he doesn’t accidentally plug Rover in his hunt for something to kill. Hunting in national parks would be sanctioned, especially for feral deer. The thought of Bob with an over-and-under, pump-action persuader gives one deep pause … just make sure if any of youse blokes see him with one, don’t get flustered and say ‘Hi, darl’ instead of ‘Hi, Carl’ Otherwise you may end up with a bum full of buckshot. 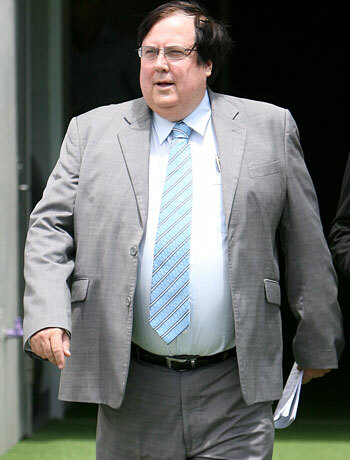 Oh, Clive, you are a one - and a half. Finally, on the local council scene, The Magpie was checking out some of the lesser known candidates on Dale Last’s team when he was thrown into deep contemplation when reading about one Donna Marano. Her bio began with the startling line ‘ Donna was born and raised in Townsville and has lived in Wulguru with her husband Anthony and three young children for 18 years’. So what happened, dear? The kiddies somehow clung on to their youth and refused to attain adulthood even after 18 years? Oh, well, lots of help there for stuffing letter boxes – if they can reach that high. Enough now, it is time to grace Poseurs’ Bar with the avian presence, and trust his punk, drunk and desperado mates are speaking of guns when they start whispering about a large bore. And trusts that the subject is NOT guns if some bebubbled lass starts talking about banging away in the night.